In the spirit of all those beautifully clad ladies - and maybe a hussy or two - I'm sharing this post again featuring the perfect accessory - including a link to directions for knitting one yourself. As we've noted here before, the dramatic change in women's fashion in the late 18th and early 19th c not only meant the temporary end of wide skirts with hoops, but also the invention of a necessary new accessory: the purse. Gone were the days when a woman could tuck all her little necessities in an over sized pocket that tied around her waist and was hidden beneath voluminous petticoats. Much as purses are today, the new bags were often as stylish as they were utilitarian, and added a touch of bright color and whimsy to the ubiquitous white muslin gowns. Many of you mavens of historic dress will recognize the picture of the gown, left. It has appeared in several of the excellent fashion books featuring the holdings of the Kyoto Costume Institute, and is all over fashion history blogs and pages on Pinterest. The gown is French, c 1800, of silk taffeta with a drawstring waist. The shawl is silk net with an embroidered floral motif and silk fringe, and the hat is also silk net and pongee with a tassel. But it's the pineapple dangling from the lady's wrist that has always intrigued me. Little bags like this were called reticules, from the French and earlier Latin for a small net or mesh bag. (There's another charming, if unsubstantiated, explanation that the word is a mocking derivative from ridicule, the French word for ridiculous.) 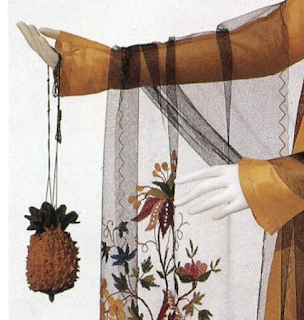 Pineapples and other exotic fruit had become a fashion-forward motif thanks to the trendsetting Josephine de Beauharnais Bonaparte, born on the Caribbean island of Martinique. This pineapple-shaped reticule was knitted in yellow and green silk with silver beads for accents, and the top with the leaves pulls open with the tasseled drawstrings. It's a wonderful, witty example of three-dimensional knitting, whether the skilled workmanship of a professional knitter or a dedicated lady. For a zoomable view of the bag on the Kyoto web site, click here. The fashion for knitted and crocheted pineapples outlived Napoleon, with directions or "recipes" for them appearing in lady's magazines well into the mid-19th century. One version of the "Pine Apple Bag" appeared in The Lady's Assistant, for executing useful and fancy designs in knitting, netting, and crochetwork, published by Mrs. Jane Gaugain in 1840. Contemporary needleworker/blogger Isabel Gancedo has adapted this pattern for modern knitters, and posted both her version and Mrs. Gaugain's on her website here. Be forewarned: this is a challenging pattern for experienced knitters – but if you're game, the results are delightful! Many thanks to Janea Whitacre for pointing me towards Ms. Gancedo's on-line instructions. Franklin Habit has also created a modern knitting pattern adaption of Jane Gaugain's pineapple bag. It is available for free in Knitty magazine: http://knitty.com/ISSUEss12/FEATss12SIT.php (Knitty is one of the most popular knitting magazines on the web). I can't speak to the quality of either pattern, but I do know that Knitty's patterns undergo technical editing that may not be found in independent patterns. Here's another modern adaptation of this same pattern. I've been meaning to make one for ages (I think they're adorable,) but have never gotten around to it! I do love pineapples--particularly on my plate--and long have associated them with the sign of hospitality. I feel compelled to mention, however, that they have sad associations for people of color, since when they were displayed in port towns in America, they signaled that a slave ship had arrived. The needle work is adorable, and in England the fruit was simply an exotic delight for the ladies who worked the patterns--but history is complex, and I guess I can't think about the history of the pinapple single-mindedly any more. 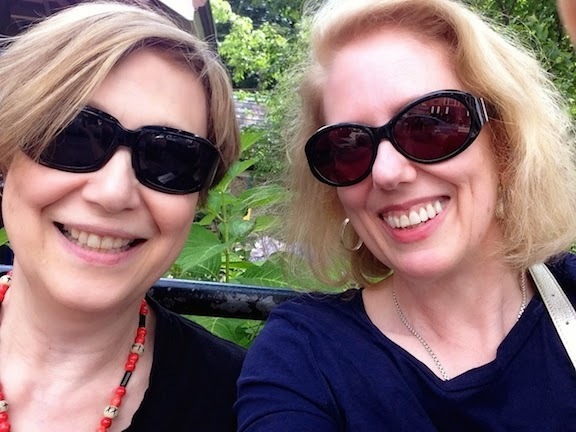 Hi Susan: Oops--I was not able to find that so-important primary source. All I could do was to trace the notion back to C.S. Manigold's book Ten Hills Farm, about the history of slavery in Boston. She's a reliable researcher, but I confess that I don't have the book in front of me, and don't know how she handled the material. I am currently editing a book about Mozart's early life, and it is very important to us to avoid passing along time-honored but unfounded tales--oh my, what a job that is. Thanks for calling me on it. Desespoir des ennemis de la France….